Will AppThemes work with my website? AppThemes are website templates (themes) that work with WordPress. If you have WordPress installed, it’s easy to just upload and install our themes. WordPress is best known as a blogging platform but has evolved into a full-blown CMS (content management system). It is an easy to install open-source software that is available for free. Most hosting providers have an automated installer so you don’t even need to worry about working with a technical person. A CMS is a type of software that allows people to easily manage their website without any technical knowledge. You can create user accounts, define page templates, and publish blog posts or pages all from within it’s GUI (graphical user interface). Using a hosted CMS is a great way to remove the IT layer from your business. Are AppThemes WordPress plugins and will it work with my existing site? AppThemes are WordPress premium themes and not just simple plugins. AppThemes are designed as standalone themes to replace your existing one. It will also work in conjunction with your existing website but you will need to create a separate instance of WordPress in a sub-directory. For example, http://www.test.com is your current WordPress site. You will need to install another copy of WordPress in http://www.test.com/classifieds/ which is where you’d place the AppThemes theme. What are the requirements to use AppThemes? AppThemes does not work as a standalone solution. It is a theme which runs on the free CMS blogging software, WordPress which requires a web server such as apache, a mySQL database, and PHP. If your hosting provider allows WordPress to run on it (over 95% of them do), then AppThemes should work fine. You might also need FTP access to upload the theme and admin permissions to change/create folders. This is very common for any web hosting provider. We are partners with some of the best affordable and reliable web hosting providers out there today. They are certified WordPress partners and will have no problem running our themes. Does AppThemes encode or encrypt the source code? No. Once you purchase any of our themes, you will get full access to the code and can modify it however you please. We believe in creativity and encourage customers to enhance or customize AppThemes to fit their business solutions. I have specific questions I need answered before making a purchase. How can I ask them? If you couldn’t find the answer on the theme or plugin page, just send them to our pre-sales team They’ll respond via email typically within 24-48 hours. Once you select the product you’d like to purchase, you will be taken to our checkout page. There you will need to create a username and password so you can later login and download your purchase. Next you will be redirected to a secure checkout page where you can either pay via e-check, credit card, or PayPal/Google Wallet funds. Once payment has been processed, you’ll be able to login and download your purchase. Nope. Since our software is not encrypted, we aren’t able to currently offer a free trial. We do have live demos of each of our themes which you can play with and even check out the administration backend options. We accept payments from two of the most popular payment gateways — PayPal and Google Wallet. PayPal accepts credit cards as well. All orders are processed directly on their sites using the industry standard SSL (secure socket layer otherwise known as https) so you don’t need to worry about security. We do not store any credit card or payment processing information in our system. All three gateways accept credit cards or funds already deposited within your accounts. With PayPal, you can also pay via e-check but it takes 5-7 days before your order will clear. What if my country doesn’t allow PayPal or Google Wallet payments? At this time we are only able to accept payments via these two gateways. If you have a friend in another country which allows one of those payment gateways, you might want to ask them to make the purchase for you. Where is the credit card option on the PayPal site? On the actual PayPal checkout page, you will need to find the “Don’t have a PayPal account?” section and click on the “continue” link. 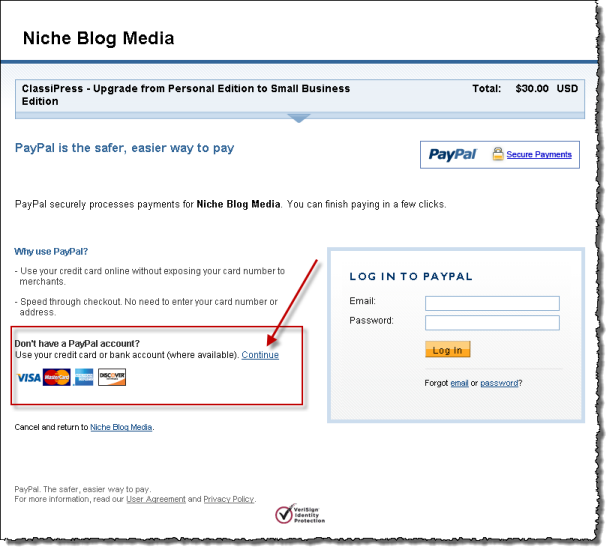 Here is a screen shot of the PayPal credit card option. How much does the annual renewal cost? For standard and developer editions, the annual renewal is $29 per theme. For Club standard and developer editions, the annual renewal is $79. What does the annual subscription price cover? It extends your product support, forum access, and updates for another 12 months. I don’t remember my account username. How can I retrieve it? Send us a support request. Once we verify your account, we’ll resend your login details. I forgot my account password. How can I reset it? On the account login page, there is a “forgot password” option. Enter your email address and it will be resent to you. I got locked out of my account. How can I unlock it? Do I have a separate login for the forums? AppThemes uses single sign-on which means you only need one username and password for everything. You should have received an email after purchasing one of our products which contains your login credentials. If you can’t find that email then go to the account login page and try the “forgot password” option. Enter your username or email address and it will be re-sent to you. If you still have trouble the contact support directly. I just bought a theme and don’t know how to download it. What do I do? After you have purchased a theme you need to login to your account. The link is in the top right header of AppThemes. Within your account dashboard, you will see the themes you purchased. Click on each one and then download it. I don’t see the theme I just purchased in my account. How can I download it? Sometimes there is a delay in processing your payment. If it’s “pending”, then check back later. If it’s still not showing up after an hour, please contact us. E-checks usually take 2-3 days before they are processed. You should receive an email once it has gone through. When trying to purchase a theme it says my username already exists. How is this possible? If you’ve previously purchased a theme or are an affiliate, you already have an account. After you’ve added items to your cart and proceeded to checkout, you’ll see “Already have an account? Login to bypass registration.” right above the sign up form. Click the link, login, and you’ll be redirected back to the checkout page. If you haven’t ever registered with us, it’s likely someone has already chosen that username. I purchased an older version of a theme and would like to get the latest version. How do I download it? You can always download the latest version of all themes you have purchased from within your user account dashboard. You’ll need to login first. I purchased a theme but don’t know how to install and configure it. What should I do? Each AppThemes theme comes with its own set of installation instructions. This should be available to you within your account dashboard. A new version of a theme recently came out and I want to know what the changes are. How can I find out? All product release notes can be found on our Docs site. If you download the latest version instead of auto-upgrading, there is a text file inside the .zip called, “changelog.txt”. That will list out the changes for each version. I love AppThemes but want to change the design around to better fit my site. How can I do this? The best way to do this is by creating what’s called a WordPress child theme. This isn’t too difficult if you’re a programmer but there is somewhat of a learning curve. Here’s a simple tutorial to get you started. Why can’t I just modify the theme files directly? Well, technically you can but we don’t recommend it. Here’s why. We release several updates each year. Any changes you make will be lost during the upgrade process. If you’re ok with that or really don’t care about future updates, then read on. If you are familiar with WordPress theme files, php, css, and html then you should have no problem customizing our themes to match your existing website. This is not covered under the AppThemes support package so it will be up to the community to answer your questions. For starters, you’ll want to edit the header.php and style.css files. If you aren’t technical then I’d recommend hiring a WordPress consultant. How can I upgrade to the Developer or Club Edition? Since you’re already a customer and have an account, you just need to login. Then from your dashboard, click on the “Upgrade Options” link in the sidebar. There you can easily checkout and purchase an upgrade. After your payment has been received, you will instantly be able to download the upgrade from your account dashboard. Just login to your account and click on the “Upgrade Options” link in the sidebar. There you will find renewal options based on your theme purchase. What are the annual renewal prices? For a single theme (Standard or Developer Edition), the renewal is $29 per each additional year. For Club (Standard or Developer Edition), the renewal is $79 per year. This includes any product updates and access to our support team during your subscription. Can I buy the renewal before my existing subscription expires? Yes. In fact, we recommend this so there’s no gap in your service. The new subscription won’t start until your current subscription ends. If you renew after expiration, your new subscription begins on that date and will expire a year later. Once your subscription has ended, you will no longer be able to access our support forums or download product updates (including the Updater Plugin). Just like any software, we recommend continuing your subscription so you can stay up-to-date with the latest new features and important fixes. For less than $0.08/day (or $0.22 for Club), it’s well worth the peace of mind. What license does AppThemes abide by? All our themes are licensed under the GNU general public license which means they may be used by our customers on as many websites as they like. Customers purchasing the Developer Edition have access to the Photoshop design files. These source files are licensed and copyrighted under AppThemes and are not GPL. You may not redistribute these files or claim them as your work. Can I get a refund after I’ve made my purchase? No. All sales are final since AppThemes are software and instantly downloadable digital media. Once you have our software, there is no way to “return” it. The good news is we rarely have anyone ask for a refund since they enjoy our themes so much. Does AppThemes have partner web sites that can sell or distribute our themes? No. Any other site you find selling or providing a copy of our themes for free are not authorized by AppThemes. Purchasing themes from any source other than the AppThemes website means you will not have access to AppThemes support or theme updates. They may claim to be “licensed resellers” or “distributors” but there is no such thing. Also, downloading a nulled version (free copy) from other web sites is very dangerous. You have no idea what malicious code has been added to the theme and risk losing your web site and database. Read this article and this article for more details.